There are many ways for which a person can be considered exceptional. Someone might be an extraordinary scholar, philosopher, or philanthropist. Maybe an artist. Or athlete. Whatever the case, exceptional people share this common trait: they have found a way to improve not only themselves but also their own community and, in some cases, the larger world community. Catharine Hamilton is not only an exceptionally graceful individual, with an elegant Texan drawl and charmed sense of style, she has dedicated her time to many great causes and organizations, from the Institute of International Education and the Junior League to the cause closest to her heart, the restoration of Versailles. Photo from the Catharine Hamilton Collection. Catharine took a moment to speak with me about the project, her excitement clear with every word she spoke about the royal French château. "I went on a two month trip with my mother after my graduation from high school when I was seventeen. We traveled throughout Europe to the major capitols and had wonderful time. That was the first time I had seen Versailles, and I was just amazed by the artisanship, the beauty--the profound beauty. It influenced me tremendously, never thinking I would ever have anything to do with it other than just to be awestruck by its history and its beauty and its size and magnitude and magnificence." Versailles has a rich history. Its grandeur was a political statement that came to symbolize absolute monarchy during the reigns of Louis XIII and XIV. As building campaigns expanded the château from a hunting lodge to the expansive monument it is today, the nobility lived there alongside the king, creating the first truly centralized French government. Peter the Great of Russia was inspired to build the Peterhof Palace in Saint Petersburg after visiting Versailles. For all its historical significance and striking beauty, Catherine is passionate about preserving the palace's history, and she shares this passion with as many others as she can. "People, first of all, have to believe in internationalism," Catharine Hamilton explained to me. "They have to believe in preservation, restoration, and beauty and friendship. Those are key elements." Key elements, that is, to fundraising for the restoration projects she heads. Specifically, Catharine has worked to reconstruct the Trois Fontaines Bosquet, designed by King Louis XIV and renowned garden architect André Le Nôtre. "It has three fountains and is one of Le Norte's masterpieces. Le Norte was the quintessential garden architect to the King. It is still very important in garden architecture today. ... We were walked through the gardens, and I finally thought about it for two days and I realized, 'oh my goodness, this is really a big project.' It is about the size of three football fields. And, it was just totally overgrown. There was nothing there." 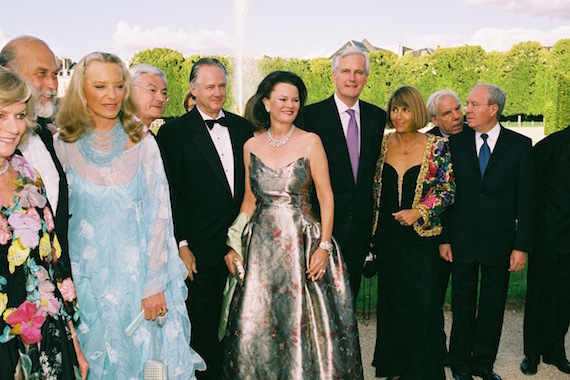 So Catharine Hamilton founded the American Friends of Versailles in 1998 with the stated goal "to improve and promote positive goodwill between our two nations on a long-term basis" and began work to raise funds for the restoration of the Trois Fontaines Bosque as well as the Pavillon Frais. Incredible attention to detail means that the newly rebuilt gardens will have the closest possible resemblance to the gardens through which the king himself walked, down to the shadows cast by the structures and greenery. Much has been accomplished over the years, but the upkeep is an ongoing process, and there is always more to do. Versailles is the world's largest museum, visited by more Americans than any individual museum in the United States, Catharine's website explains. UNESCO has designated Versailles an international world treasure. This is reason enough for Americans to get on board to preserve its beauty and history, but there are many more. Addressing the concern of political criticism, Catharine explains, "France and America don't always see eye to eye, but we've had the Kosovo War, the Afghan War, the Iraq War. We just go on. Yes, there are people who stand very fervently at times against one nation or another. But, those things change and the only constant in life is change. France is the oldest ally of the United States. They supported us in our Revolutionary War and were the first to recognize America as independent. Many, many meetings of world importance were held at Versailles--The Treaty of Paris which ended our war with Britain. The Treaty of Versailles that ended the war between Germany and the Allied Powers."